Although first-time claims for unemployment have been basically flat so far this year, the big change that is visible in the labor market is that the number of people receiving unemployment insurance has dropped by almost one third so far this year (green line in the chart above). This may reflect the fact that more people are finding jobs, but it also may reflect the fact that more people are getting desperate to find a job since they no longer are receiving jobless benefits. In any event, this is a significant change on the margin that deserves to be highlighted. It may lose some potency, however, since Congress has once again decided to extend eligibility for unemployment benefits. Whatever the case, the incentive to find a job has definitely increased year to date, and this is probably a good thing for the economy as a whole. 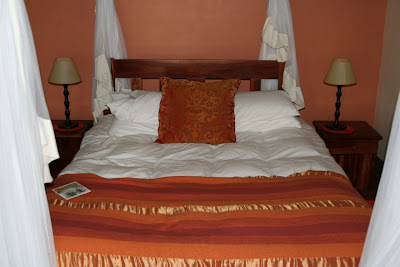 The Victoria Falls Hotel in Zimbabwe is world famous, and that's where we are staying. It's also a magnificent hotel, and I can't imagine staying anywhere else if you are in this neighborhood. If you walk from the hotel entrance through its courtyard and then out to the grounds that look toward the famous Victoria Falls (which are the source of the water vapor you see in the upper left hand corner of the photo), you see a big flagpole—the bottom of which is shown in this photo—and in the distance the famous bridge that spans the gorge coming out of the falls. After taking the photo, however, I started to wonder. First, I thought it was amazing that the hotel was situated over 5,000 miles south of Cairo, and 1,600 miles north of Cape Town. Africa is certainly a huge continent. Then I started trying to make sense of directions. So I pulled out my trusty iPhone, and discovered that the falls were East-North-East of the hotel, and that looking from the flagpole to the bridge (in the photo above) was almost directly East. I turned on the Compass app on my iPhone and confirmed that from the position this photo was taken, North was to the left, and South was to the right, just exactly the opposite of what this famous plaque shows. To make sure, I called up the Maps app on my iPhone and looked at satellite imagery of the hotel and falls, and confirmed again that the plaque was wrong. Cairo lies 5,165 miles to the left, and Cape Town 1,647 miles to the right of the flagpole. After an enjoyable dinner and show tonight, we went to see the assistant manager of the hotel, and I showed him my iPhone and how I had discovered that the plaque was exactly wrong. He was speechless. As an added bonus, we then began to hear the sound of vuvuzuelas coming from the front entrance to the hotel. Apparently, a large elephant had entered the grounds of the hotel, and hotel staff were trying to persuade him to leave by blowing on vuvuzuelas (which of course have become famous for ruining the hearing of all those attending the World Cup FIFA games in So. Africa). Turns out elephants don't like the sound either, and this one was indeed persuaded to leave. Here are some shots taken while touring the falls this morning. The tremendous volume of water that falls into a relatively narrow gorge blows incredible amounts of water up into the air, creating what in some places is a virtual thunderstorm of rain and wind. It's very impressive. Before arriving in Victoria Falls, we spent two nights at the Imbabala Zambezi Safari Lodge, located just after you cross the border from Kasane, Botswana, to Zimbabwe. We had a very charming and beautifully decorated chalet, the porch of which you can see in the photo above, and the bed which you can see below. 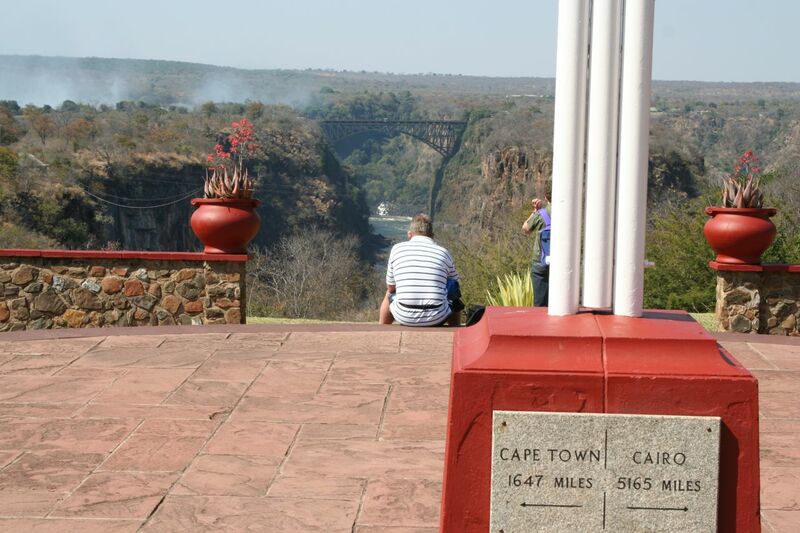 Each unit had a spectacular view of the broad and lazy Zambezi river, shown below. The couple in the photo are Lowell and Linda Rice, good friends of ours who have done a fantastic job of organizing the trip. 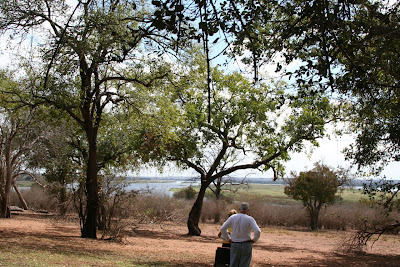 There is no way on earth we could have done and seen all that we have without their years of experience with Africa. 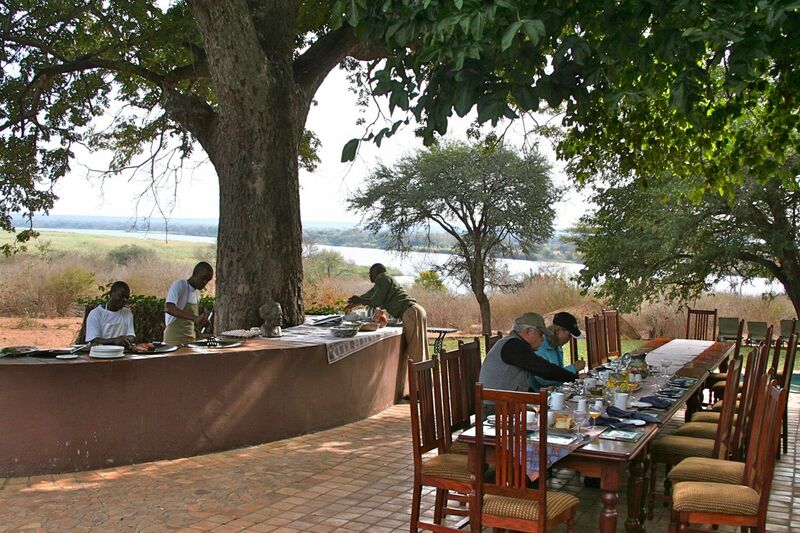 Shown below is the main table which is set for breakfast. Karen Poole, the proprietor, had almost a dozen people on staff to attend to our party of 22. I had the best bacon and eggs ever, and later learned that the bacon, which looked like Canadian bacon, was actually Wart Hog bacon! That little animal may be the runt of Africa, but it is very tasty. 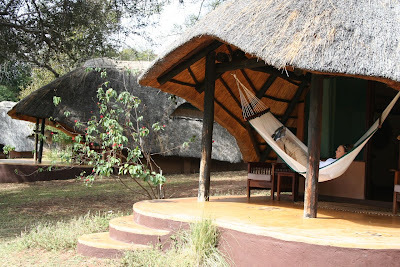 Karen's blog is a running commentary on life at Imbabala, transporting you instantly to another world. 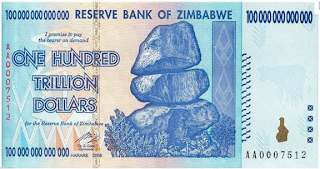 I'm now in possession of trillions of dollars of Zimbabwean currency, thanks to Karen Poole, the gracious proprietor of the Imbabala Zambezi Safari Lodge, where we spent a few days before moving on to Victoria Falls. (More on the charming Imbabala to come.) Unfortunately it's worthless, the victim of world-record-setting inflation. Last year Zimbabwe finally gave up on its efforts to maintain its own currency, and the people are still cheering. It's now legal to use any hard currency to settle bills and debts, and most places are simply pricing things in dollars. As a result, inflation collapsed from a high of over 20,000% to essentially zero, virtually overnight. Confidence and economic activity are picking up as economic turmoil has almost vanished. It's one more example of how economic growth thrives when inflation is low and uncertainty is eliminated. Put another way, if printing lots of money could contribute to growth, Zimbabwe would be the strongest economy in the world, but of course it's not. That's another reminder for those who want the Fed to ease even further: economic growth cannot be created by the printing press. On the contrary, the U.S. economy would be doing better today if the Fed addressed the looming inflation threat represented by the $1.3 trillion dollars of bank reserves it has injected in the past two years. 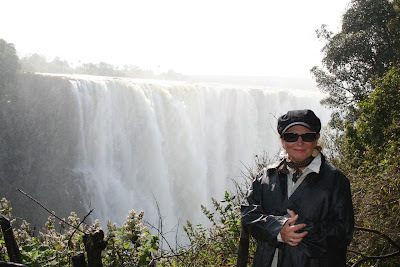 I'm now in Victoria Falls (Zimbabwe) and finally have some access to the internet (though quite slow). I picked up a cold somewhere out in the bush last week, so I stayed in the hotel this afternoon to catch up on the market rather than go out shopping with my wife. I'm still sorting through photos, and hope to post some interesting shots soon. As I review the data of today and the past week or so, not much seems to have changed. (Indeed real changes only occur infrequently.) The economy is growing, but it is growing slowly and it is still about 10% below where it should be if it were to continue it's long-term trend growth of 3.1%, as shown in the chart above. It is this shortfall (aka the output gap) that is the source of the economy's still-high unemployment rate and the general sense of dissatisfaction and even anguish in some sectors of the economy. The problem with this recovery is that it has been weak, much weaker than other recoveries following deep recessions such as the one we have just had. The Obama administration and Paul Krugman would have you believe that this weakness is due to a lack of fiscal stimulus (i.e., the trillion dollars of stimulus pumped into the economy so far has not been enough), but as I and most other supply-siders have argued for a long time, the economy's slow growth is most likely due to the fact that the fiscal stimulus that has been applied has been the wrong kind of stimulus. Instead of increased transfer payments and make-work projects we should have cut taxes; the way to help get the economy growing again is to make lasting changes to the incentive structure, in order to encourage people to work harder and corporations to invest in new plant and equipment and new ventures. The Keynesian prescription for a stronger economy has once again failed, with the result that we have dug ourselves deeper into a debt pit and have very little to show for it. This should be the rallying cry for politicians to support efforts to keep the Bush tax cuts from expiring at the end of this year. Indeed, instead of allowing taxes to rise, we ought to at the very least cut corporate income taxes in order to encourage companies to invest the mountain of profits they have accumulated over the years. (Recall my oft-cited statistic that corporate profits have more than doubled since 1998, yet the S&P 500 hasn't risen at all over the intervening period.) Corporate profits after tax are now running at a $1.2 trillion annual rate, but they are effectively being used not to create new jobs but to fund the federal government's ineffective and wasteful spending. The way to speed up growth is simple: cut spending and cut taxes. One thing that grabbed my attention in today's GDP numbers was the increase in the broadest measure of inflation, the GDP deflator. From a quarterly annualized low of -1.2% at the end of 2008, it has jumped up to 1.8%. This is a very important development because it directly contradicts established wisdom which holds that with a large output gap such as we have today, the economy should be experiencing deflationary pressures. On the contrary, inflation is now rising. I've been talking about this issue for almost two years now, warning that it is easy money, not a weak economy, that will drive inflation: easy money is now showing up as rising inflation (albeit still quite low from an historical perspective, but nevertheless definitely rising at a time when most Keynesian models would be forecasting deflation), even though the economy remains significantly below its long-term potential and there are plenty of idle resources out there. Thus, I see evidence in today's data that supports my rising inflation thesis. In other news, I see that the Chicago and Milwaukee purchasing managers' indices were both stronger than expected in July, and both remain at levels that strongly suggest continued economic growth. I also note that non-energy commodity prices (e.g. the JOC and the CRB Spot) have moved up in the past two weeks, and that bolsters my belief that the global economy continues to be healthy, and a healthy global economy in turn will help support the U.S. economy going forward. Importantly, I still no sign at all of the economy slipping into another recession or slowing down meaningfully. 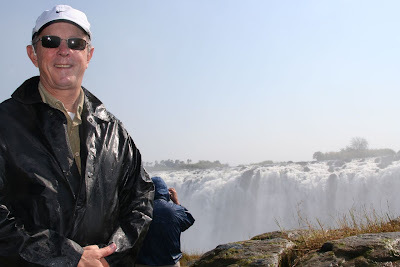 Early tomorrow we leave for a safari/excursion that will take us to Victoria Falls in 8 days, at which time I hope to be back in touch with the world. I haven't had much time in any event, as our itinerary has been pretty full. From my limited perspective the world hasn't changed much in the past 10 days, and I doubt it will in the next week. If anything, corporate profits continue to impress on the upside, and the passage of time is undoubtedly healing a lot of wounds, as it tends to do. Key financial indicators like credit and swap spreads have settled back down, and Europe seems to have avoided a banking crisis. The U.S. economy is facing headwinds, to be sure: misguided fiscal policy is soaking up a lot of the economy's productive resources (i.e., transfer payments) and thus holding back productivity and job growth; and uncertainty regarding the future of monetary policy and the future of tax rates is keeping a lot of investors and projects sidelined. These headwinds are serious, but they are not a reason for the economy to slide back into recession. Recessions don't happen easily, and the U.S. economy has proven to be very resilient and dynamic in the face of adversity (recall that the recession of 2001 was mild, and it ended soon after the time that 9/11 happened). The Fed has dumped a trillion dollars of reserves into the banking system, but that hasn't resulted yet in a meaningful increase in the money supply because a) lots of folks are deleveraging and have no interest in borrowing from banks, b) many banks are still reluctant to lend, and c) credit markets are still shell-shocked from the events of the past several years and are not yet back to normal (and regulators are impeding progress, thanks to the new financial regulations pouring out of Congress). But the important measures of money supply (currency, M1, and M2) are all growing and show no signs whatsoever of any contraction or slowdown that might prove deflationary or choke off growth. Residential construction has fallen so much that it can hardly pose a risk to the economy going forward. Confidence in general is still low and there are lots of bears out there, but that just means that good news (or simply the failure of bad news to turn up) becomes a more potent force to the upside. The economy's problems are slowly fading, and the policy outlook is likely to improve significantly as November draws closer—this is the biggest thing on the horizon right now. Meanwhile, jobs are now being created, albeit slowly, but they are no longer being destroyed. Those who are working are doing just fine, as productivity has been quite healthy. Much of the world is doing pretty well, and some places, like China and India, are growing like weeds. Commodity prices show no sign of flagging demand. The yield curve is very steep, and that makes it easy for bank profits to mushroom; plus, a steep yield curve has been a very reliable predictor of recoveries. Finally, I know that unemployment is quite high in S. Africa, but I've been very impressed with the general level of prosperity I've seen here. I'm in Johannesburg now and traveled overnight to get here from Cairo and we've been out in the country touring all day, so I can't spend much time on this. Housing starts were weaker than expected, but they are still up 15% from their lows of last year. I still think we've seen the bottom in housing. Construction is so far below the level needed to keep pace with new family formations that inventories are being worked off and this will almost guarantee stronger construction activity in the years to come. I haven't expected to see a strong recovery in housing in any event—I've been calling for a gradual increase over the next year or so—so this data looks to be consistent with that. The standing obelisk in this photo is about 100 feet high, and is visible for 50 miles. 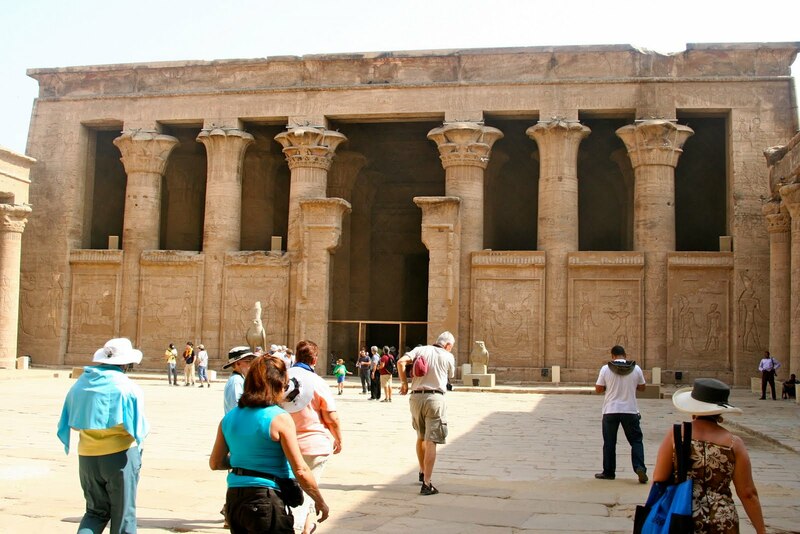 It was erected about 3,500 years ago, and stands today in the Temple of Karnack in Luxor, Eqypt. It is made of a solid piece of granite that was quarried a few hundred miles from the temple. It is almost 100 feet high and weighs about 300 tons (almost two-thirds of a million pounds). Today, it still stands almost vertically without the help of rebar or cement. How it was carved out of a mountainside and transported over hundreds of miles thousands of years ago and raised to a vertical position is beyond my power of comprehension. Jude Wanniski, one of my mentors and perhaps the most prolific writer on the interaction between politics and economics, once related to me an allegory about productivity that has stayed with me for many years. (I'm sure he got it from someone else, but I can't remember right now.) I was reminded of this a few days ago when I was visiting the site of the Russian monument to cooperation with Egypt that stands near the Aswan High Dam. The original allegory goes something like this, though I'm sure to mangle it: A politician and a union boss are walking by a construction site. They see two giant machines excavating the ground in preparation for the foundation of a large building. Each machine is operated by a single person. The union boss laments that if it weren't for the machines, there could be hundreds of workers digging the foundation with shovels, creating so many more jobs and (presumably) so much more prosperity. The politician sneers, and says, "just think how many thousands of people could be employed here if it weren't for shovels, and they had to dig the foundation with their hands!" What this illustrates is that the economically illiterate don't understand the virtues of productivity. It is always better to find a way to do something with fewer people. Why have thousands scooping sand out of the ground, when one could do the job with a big earth mover? If thousands weren't needed to perform a task that could be accomplished by just one, then the thousands could spend their time doing something else, and we would all be better off. And so it was that I was reminded of this when I walked up to the Russian monument and saw three workers sitting on the grass on each side of the entrance, cutting the grass by holding it with the fingers of their left hand and cutting it with a knife held in their right. I saw another example on the way to the airport in Luxor this morning, when I spotted a half dozen workers sweeping debris from the side of the highway (a few miles long at least) with push brooms. Undoubtedly there are at least a few politicians in Egypt who are reluctant to replace those workers with lawn mowers and street sweeping machines, out of concern for the jobs that might be otherwise lost. If only they would think about how much more productive those workers could be (and how much more they could earn) if they could be part of a more worthwhile enterprise. Yes, many will be thinking that the real problem is that Egypt doesn't have the money to buy lawn mowers and street sweeping machines. But that is what politicians here should be focusing on. It takes capital to buy machines that increase workers' productivity, so attracting capital to Egypt should be job #1 for smart politicians. Here's how: Enforce the rule of law. Enforce property rights. Eliminate corruption. Promote free markets. Offer incentives to new investment by keeping taxes low and flat. Minimize the expansion of government and regulatory burdens. Avoid social engineering and tax breaks for favored industries. Make Egypt a haven for investment, and watch living standards rise. With enough capital, capitalists would be quick to grab workers off the streets and teach them to operate the productive machinery. UPDATE: Good friend Don Luskin reminds me that the allegory I was trying to remember here was originally told by Milton Friedman. 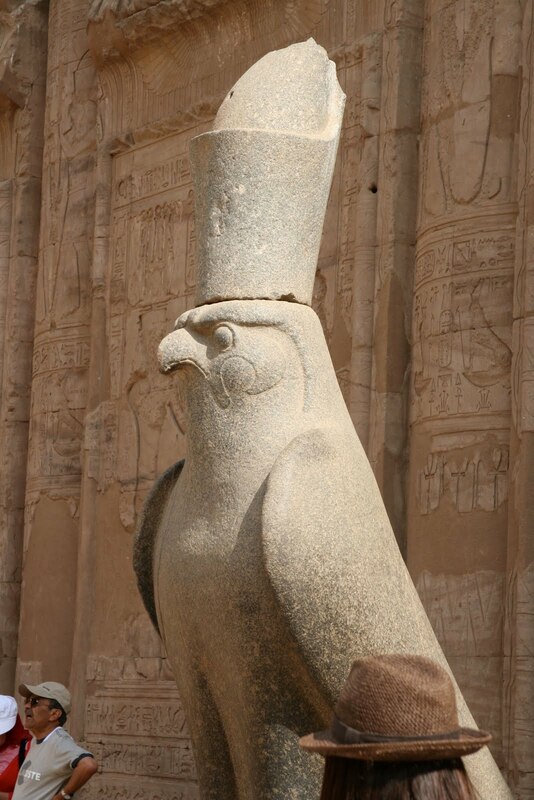 Here's a shot of a granite statue of the Egyptian god Horus, found at the Temple of Edfu which we visited this morning. 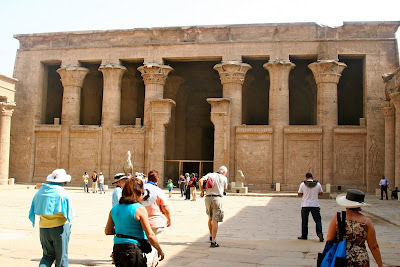 It can be found inside the Temple of Edfu, which is the largest and most perfectly preserved Egyptian temple in Egypt. So big, in fact, that I couldn't get a shot of the whole thing. The next photo is a shot of part of the interior. This structure was completed about 85 years BC. Now I know where the European cathedrals got the idea for big columns. The Producer Price Index fell by 0.5% in June, but that was mainly due to lower energy prices. Over the past year it is still up 2.7%. The core PPI is up 1% over the past year, and it has risen at a 2% annualized pace over the past six months, which is a definite pickup from the zero increase that occurred over the last six months of 2009. After having been relatively flat since early this year, claims appear to have resumed their decline with today's release. To be truthful, of course, actual (non-seasonally-adjusted)claims have risen in the past few weeks, but they have risen by less than usual, as automakers and other manufacturers have not laid off as many people this year as they normally do. Thus the seasonally-adjusted number has dropped. Fewer-than-expected layoffs are still a good thing, and one more sign that the economy continues to gradually improve. The title of this post is a bit tongue-in-cheek, but it's clear that the only time in recent years that the dollar has managed to rise above historical lows has been thanks to widespread concerns that the global economy was approaching an Armageddon of sorts. The most recent spike in the dollar was fueled by concerns that the Euro was about to collapse, but now we see that those fears were overblown. The dollar's value since early 2008 has been pushed up by panic-driven demand for dollars, but it has been depressed by extremely expansive monetary policy. Given that fears still abound (witness 3% 10-year Treasury yields and $1200/oz. gold prices), the fact that the dollar is only about 10% above its historical lows against other major currencies, and only about 5% above its all-time lows in inflation-adjusted terms against all currencies, as the second chart shows, suggests that the Fed's willingness to supply dollars has on balance exceeded the world's demand to hold dollars. Thus, my continuing concerns that we will see higher inflation in the years to come, and my continued belief that if the U.S. economy is struggling it is not because of a general shortage of money. The problems out there center around the unprecedented expansion of the federal government, the threat of higher tax burdens, increasingly burdensome regulations, and and the general anti-business sentiment which seems to thrive in Washington these days. These are legitimate problems, to be sure, but they do not mean the end of the world. U.S. industrial production was up only 0.1% in June, but over the past year it has increased more than 8%, recovering almost half the ground it lost from 2008-2009. Japanese industrial production is up some 20% in the past year, having recovered more than half what it lost. Eurozone industrial production is up by an impressive 9% in the past year, while U.K. production has only eked out a 1% gain. The global economy is still a long way from making a full recovery, but progress toward that end continues. This is a picture of a disappointing recovery, but compared to the global depression/deflation that was expected just over a year ago, things look fabulous. 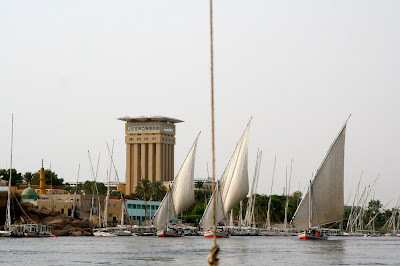 Here is one of the more unusual sights you see while sailing down the Nile. Carved into the barren hillside here are some military tombs. 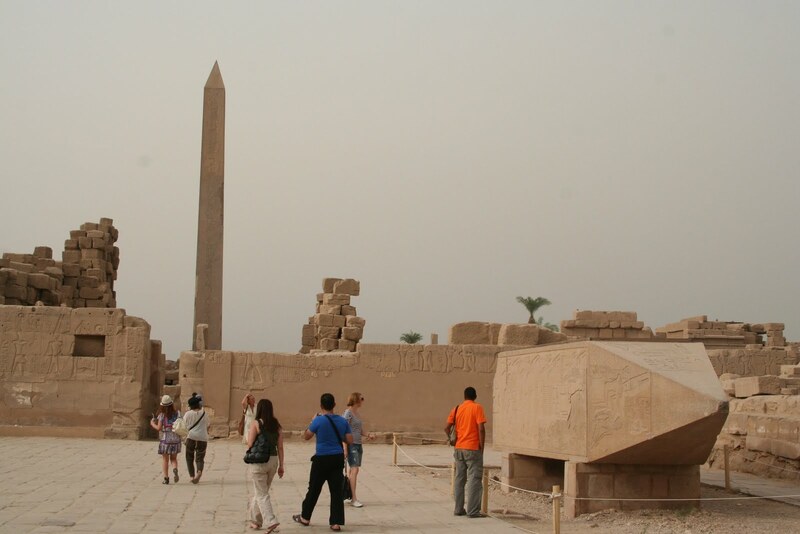 The two ramps on the left are stairways that intrepid souls can use to visit the tombs. I'm told there are some 400 floating hotels like ours that cruise the Nile—though at this time of the year a lot are idle. Ours, the Oberoi Philea, seems like one of the nicer ones. 55 staterooms, all with views of the river and little balconies. Reasonably spacious rooms. The ship is well appointed, and the food is delicious. 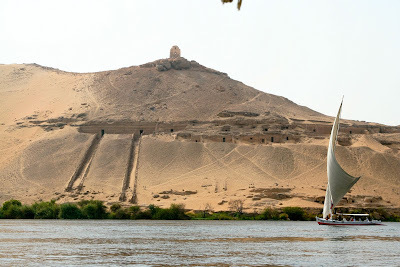 Our trip started in Aswan and will take us this afternoon to Luxor, where tomorrow we will see some sights and then head for the airport to fly back to Cairo. Despite the unbelievable heat this time of the year (it must be 120 and unusually humid), we have thoroughly enjoyed the experience. We spent our first night in Egypt at the Mena House Oberoi, which is right behind the pyramids as most people see them. This shot was taken from the balcony of our room at the hotel. 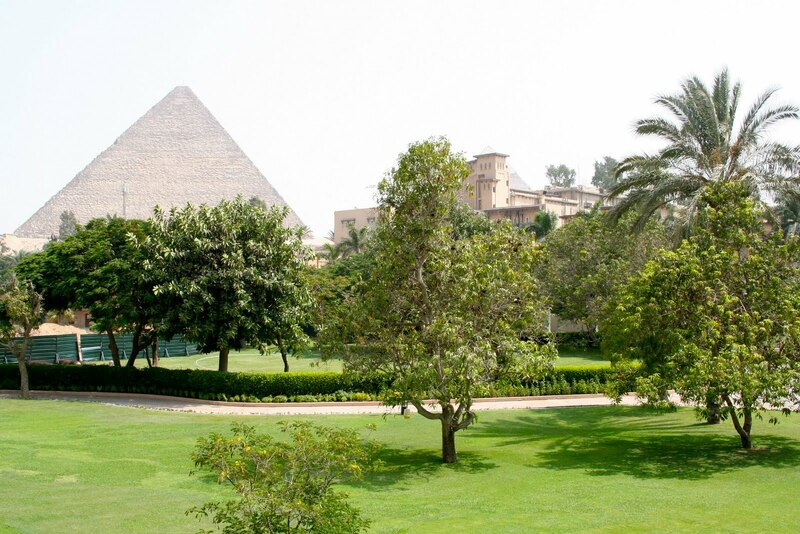 The original Mena House (the building on the right) was originally a hunting palace for the king, and it's filled with historic things like the suite where Churchill and FDR met to discuss WW II. As you can tell from this shot and others, the air in Egypt seems always to be somewhat brown, even far to the south where there is no civilization to produce smog, so I take it to be dust. 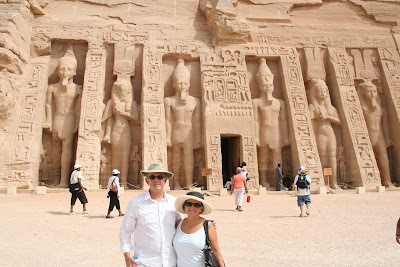 We got up at 3am the next day and flew south to Abu Simbel, to see some magnificent temples that had been relocated to higher ground to avoid being flooded by the dam created by the Aswan High Dam (Lake Nasser). This shot is of the smaller of the two temples. Very impressive. Very hot. 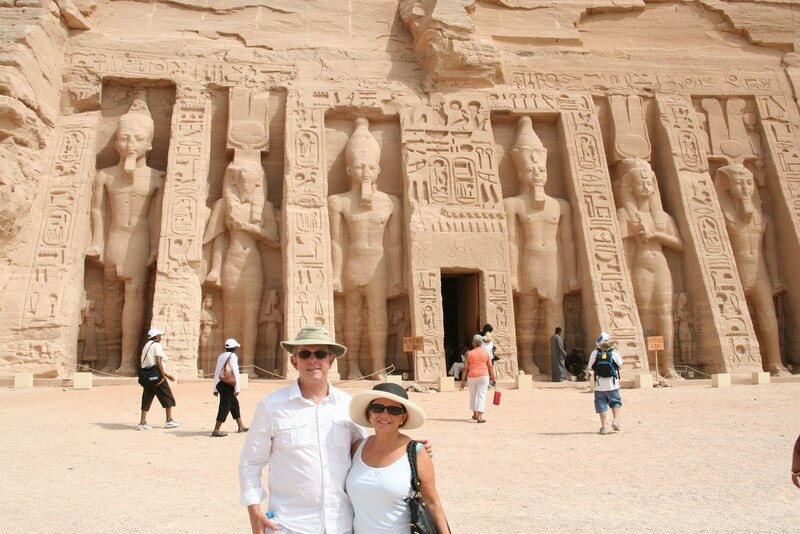 Then we flew a bit north to Aswan, the southernmost and most popular of the cities in Upper Egypt. We went sailing on one of the feluccas you see here. Amazing boats that sail very well but appear ungainly. I'm posting all this while sitting inside our boat as it cruises down the Nile. The boat must be getting a 3G signal from cell towers along the way, and passing it along in the form of (usually pretty responsive) WiFi inside the reception and bar areas. The Nile passes through what is the driest desert I have ever seen—a moonscape. Not a speck of anything grows anywhere outside the immediate vicinity of the river. Along the river all is green. 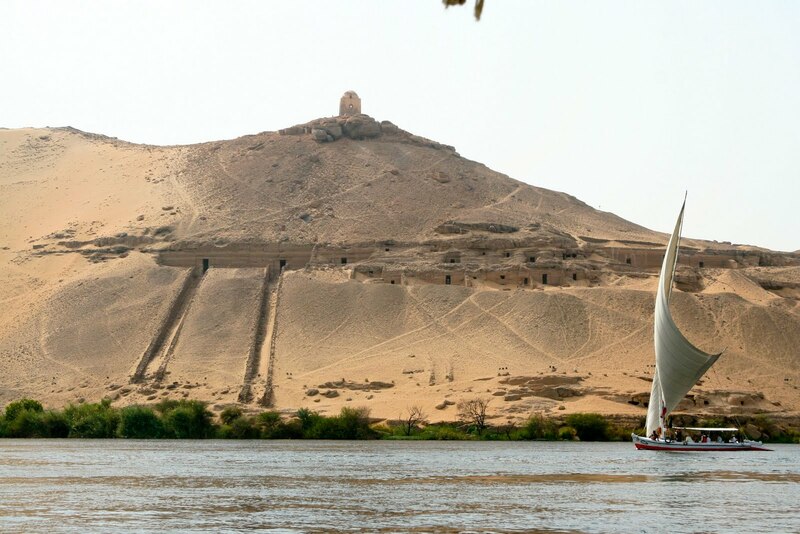 95% of the population of Egypt lives within shouting distance of the Nile, and it's easy to see why. I'm not going to try to spin the retail sales data, since they were definitely weak in June, and below expectations. But this is a volatile series, and auto and gasoline station sales contributed significantly to the reported weakness. I offer this chart to suggest that the growth rate in sales over the past year or so has been greater than it has been over the past 10 years on average. If U.S. consumers borrowed too much and spent too much (and I know many who did), then we could be living through a time of "payback." But sales growth is still positive nonetheless. It is also the case that we are only about 5% below the peak level of sales in late 2007. A set back and an incomplete recovery to date, but certainly not the end of the world. More evidence that the financial crisis in Europe is fading. Euro swap spreads are down 25 bps from their late-May highs. Greek 5-yr credit default swaps are down over 300 bps over the same period. US swap spreads are firmly in the range of what would be considered "normal." I wish I had time to elaborate, but to me it is apparent that the real risk that everyone worries about is a systemic problem, such as a Greek default, that pushes the international banking system to the verge of default—a cascading series of defaults that leaves most developed economies paralyzed. The action so far suggests that this is simply not going to happen. What we're left with is the concern that there are still lots of debt defaults that are likely to occur. The question of the day is whether these defaults will disrupt global growth significantly. I doubt they will. Debt gets defaulted on all the time, and the world has suffered through pretty massive defaults (e.g., the serial defaults of Latin American countries in the early 1980s, the Mexican default of the early 1990s, and the $100+ billion Argentine default several years ago) without really skipping a beat. After all, debt doesn't create growth, so wiping out debt doesn't necessarily destroy growth. It can be disruptive, to be sure, but it's not a growth killer per se. All it amounts to is tearing up pieces of paper that say that party A will devote some of his future cash flows to party B. Controversial, I know, but perhaps it will spark some debate. Meanwhile, I've got to get ready to explore another Egyptian ruin, this time at Kom Ombo. Meanwhile, what's not to like about this? The fears of a double-dip recession were rampant not too long ago, and now they are being slowly replaced by facts which suggest a double-dip is far from imminent (e.g. declining swap spreads, strong corporate profits, strengthening federal revenues, to name but a few). The Vix is declining as fears decline, and stock prices are moving up. Here's a quick update for the Federal budget numbers released today. The good news is that revenues really seem to have bottomed out and to now be increasing. That's not too unusual given the nature of the recession, and it confirms the good news that we have been seeing; namely that employment and incomes are picking up. The bad news is that spending appears to be stuck at a relatively high plateau, and is likely to increase further if an extension to unemployment benefits is passed, and if Obamacare is actually implemented. For now the budget deficit has subsided to 9.5% of GDP, but that is still a very large number given that the U.S. economy is by far the biggest in the world. This is going to be a festering problem that will take a long time to fix. 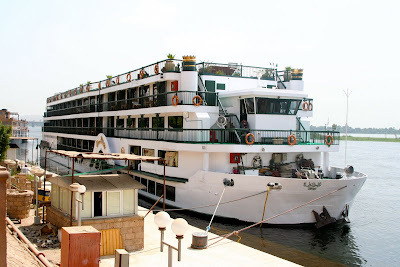 I'm on the river in Aswan, Egypt, on a mini ocean liner; tomorrow we set off down the Nile to visit various interesting things. We had a wonderful dinner tonight that seemed right out of a movie. Plus, I just discovered they have WiFi! So I thought I would make a quick post, seeing as it's after dinner and we had a big day. It's been wonderful, but also VERY hot. US exports are growing nicely, and imports are doing even better. Double-digit growth in both means all sorts of good things are happening. Strong growth in exports, as has been presaged for a long time by outbound container exports, means that exports are adding to the growth picture in the U.S. Even stronger growth in imports means that demand has U.S. consumer demand has rebounded nicely, and it also means that foreign manufacturers are benefiting. Eventually, what is good for overseas exporters is good for overseas demand for U.S. goods and services, so this is just a good old-fashioned virtuous cycle. I just can't seen anything to complain about in the overall trade picture. The financial fundamentals in Europe are improving on the margin. 2-yr German government yields are up almost 30 bps from their all-time lows of last month, which was a time when the world thought the euro was going to collapse. Euro swap spreads have dropped almost 20 bps from their highs of late May, in a sign that the market is much less concerned now about a Greek default spreading contagious death and destruction throughout the European banking community. The euro is up 6% from its low one month ago, as the likelihood of a European economic collapse and the dissolution of the euro itself begin to fade. German stocks are now up 1.3% on the year, while the S&P 500 is still down 4.8%. U.S. swap spreads, meanwhile are back to normal. The number of new weekly claims for unemployment insurance has been flat to slightly down so far this year, and that suggests that conditions in the labor market are not deteriorating and are probably improving a bit on the margin. We see the same story in the number of new jobs created this year: modest improvement. I would add that never before in history has the government been so generous in its provision of unemployment insurance, thanks to the size and extent of the emergency program. Whether that has been a factor retarding the recovery, or whether on balance it has helped, we really don't know. But if you're looking for "what's different" about this recovery, here is a big one. Equities are up over 3% today, and the Vix Index has dropped by almost half since its recent high. Given how depressed the market was until recently, I think this has all the makings of a bottom, at least for now. The financial fundamentals I watch have all improved substantially over the past month or so, even as the equity market worked itself into a lather over the prospects of a big economic slowdown. Swap spreads both here and in Europe are down meaningfully from their recent highs, and implied volatility is down significantly. Commodity prices had a meaningful correction, but they have not collapsed by any stretch. Oil is almost back up to its average over the past year. The dollar is off 5% from its recent high, another sign that the climate of fear that drove investors to dollars has subsided. Ditto for gold, which is down almost 5%. It looks to me like the equity market just got carried away, letting its attention drift from the fundamentals to worry instead about all the dire warnings being advanced by pundits everywhere. The last time I went on an extended trip was mid-March last year, about one week after the stock market hit a very ugly bottom. I'm hoping the timing of our next extended trip, which starts this weekend, will be as fortuitous. With the market action today I'm quite hopeful this will be the case. Last year we travelled to Argentina, this year to a continent I've never been to before. Friday morning we depart for New York, where we'll spend some time with our daughter. Then we depart Sunday for Cairo for one week in Egypt. Then three weeks in southern Africa, which will include the safari that everyone says you need to do at least once in your life. I plan to continue following the markets, but obviously blogging will be light and irregular until we get back. The mix of posts ought to improve, however, as I plan to take some pictures along the way and highlight some of the interesting things we hope to see and do. TIPS prices most likely peaked a week ago, and if the economy avoids a double-dip recession, as I think it will, then TIPS prices are likely to decline further, but not significantly. This chart shows the real yield on 10-yr TIPS, and it is changes in this yield that affect the market price of TIPS (inversely). I've added my subjective estimate of valuation bands to the chart. When real yields are below 1.5% I consider TIPS to be expensive, and I would note that yields have yet to drop below 1%. I think we're likely to see real yields drift up by another 50 bps, which would imply a roughly 5-6% decline in the typical TIPS fund (e.g., TIP). I don't expect TIPS to revisit "cheap" territory in the foreseeable future, since that would only occur if the Fed started to tighten monetary policy in earnest, and/or if the economy started booming. This is not a strong "sell" recommendation on TIPS, since I think they still make sense for those who want some conservative long-term protection against rising inflation. There are two ways to make money on TIPS: through price appreciation that is driven by lower real yields, or through rising inflation, since the notional value of TIPS is adjusted upwards by the change in the CPI. It's the first of these that is not likely to work going forward, but the latter still holds potential. The price of copper is traditionally such a good indicator of the economy's health that copper has earned the nickname "Dr. Copper." In this chart we see copper trading today at about the same level as it was for a few years prior to the crash of 2008. At $3/lb., copper today is worth almost five times as much as it was in November 2001, when most commodity prices hit bottom. That was also the end point of the 2001 recession, and also the beginning of what would be many years of very accommodative monetary policy from the the Federal Reserve. I keep hearing the drumbeat of deflation concern, but it's hard for me to understand. Back in the early 2000s deflation risk was extremely high: gold fell to $260/oz., most commodity prices hit lows they hadn't seen since the 1970s, and the dollar was soaring against most currencies. Now all these key indicators of the scarcity of money are reversed: commodity prices are near all-time highs, gold is $1200/oz., and the dollar is in the lower end of its historical trading range vis a vis other major currencies. If nothing else, copper prices today tell us that deflation is not a concern but that inflation is. I think copper also is telling us that the global economy is pretty healthy, as demand for the metal has been unusually strong for a number of years. My friend Mike Churchill points me to an interesting story suggesting that copper supply is also relatively tight. Whatever the case, $3 copper is saying that deflation and recession are simply nowhere to be found in the global economy. Barring an actual double-dip recession, which I think is quite unlikely, mortgage rates are most likely at or very near their lows. As this chart shows, the spread between MBS yields (which are typically about 50 bps below what homeowners pay on a 30-yr fixed rate mortgage) is about as low relative to 10-yr Treasury yields as it has ever been. 10-yr Treasuries, in turn, are down to levels that are consistent with very low inflation and economic recession. Treasury yields aren't likely to go lower unless all heck breaks loose, as it did in late 2008. For those unfamiliar with how MBS work, they have what is called "negative convexity." That means that the duration of MBS falls as yields fall, and rises as yields rise. Most other bonds have positive convexity, which means their duration increases as yields fall, and falls as yields rise. (Duration is a measure of how sensitive a bond's price is to changes in yields. A duration of 5 means that a bond's price will rise by 5% if it's yield falls by 1 percentage point.) Institutional investors (the vast majority of whom hold significant amounts of MBS in their portfolios) seeking to keep their overall portfolio duration at a given level must therefore use Treasuries and Treasury futures to hedge their MBS exposure. That means adding exposure to Treasury bonds as interest rates fall, so that the duration gain experienced by Treasuries offsets the duration loss experienced by MBS. If Treasury yields start to rise, the process must be reversed by selling Treasuries. This negative convexity dynamic can at times increase the market's volatility, exaggerating the up and down swings in interest rates, because buying increases as Treasury bond prices rise, and selling increases as bond prices fall. The long and short of it is that if this indeed proves to be the low in yields—and I think it will because I really doubt the economy is rolling over—then the rebound in yields could be rather dramatic. Yields and MBS spreads are both extraordinarily low right now, and to remain at this level or to go lower would require a rather dramatic deterioration in the economy's growth prospects. Yields are already quite low in anticipation of a double-dip; so the market would at least need a double-dip to happen to keep yields from rising. I for one just don't see the reason for the economy to collapse. In response to a reader's question, here is the sort of thing I would need to see to be worried about the future: I think it would have to be some unforeseen and unexpected government action that threw a curve ball at the markets and the economy. A round of Smoot Hawley-like tariff wars, for example, that could shut down global trade. A big change in the laws governing the financial system, in which the law of unintended consequences could step in and turn what politicians thought was a sensible "solution" into a new nightmare. A big hike in corporate income taxes, which are already the highest in the developing world. A decision to impose capital controls, which might result in a sharp reduction in foreign investment. I first articulated this theme in September 2008, and have returned to it many times since. My point is that the recession of 2008-2009 was not caused by a Federal Reserve tightening of monetary policy, the way it's been with every post-war recession. The recent recession was caused by a massive increase in the demand for money, which the Federal Reserve then struggled to accommodate. Since the Fed finally caught on and pumped up bank reserves by a cool trillion, the economy has been awash in money. Banks may be still somewhat reluctant to lend, but borrowers have also been reluctant to borrow, on balance, and many people seem to want to actually reduce their borrowing (i.e., by deleveraging). This chart shows that it takes more and more money to accommodate a growing economy and ongoing (albeit fairly low these days) inflation. The red line shows the annualized growth rate of M2 on a rolling three-month basis, and the blue bars show the annualized growth rate of nominal GDP on a quarterly basis. On average and over time, M2 tends to grow by about the same amount as nominal GDP. Over the most recent 3-mo. period ending June 21st, M2 grew at a 4.1% pace and shows signs of accelerating. I'm guessing we'll see nominal GDP growth of at least 3-4% in the second quarter, and if so that would be a sign that M2 velocity (GDP/M2) is roughly stable. I actually think that velocity is likely to increase a bit—it's been rising at a decent pace since last summer—and if so, then we could see nominal GDP come in at an even higher rate. The dollar has weakened of late, and the growth of currency in circulation (a good proxy for he world's demand for dollars) has slowed down in the past few months, and those are both good signs that M2 velocity is rising (velocity being the inverse of money demand). So with M2 rising and M2 velocity likely rising as well, there is good reason to believe that we will be seeing healthy rates of GDP growth. Again, no sign here of any slowdown or imminent recession. I suppose the worst thing you could say about the Harpex Shipping Index is that it is a lagging indicator. After all, it didn't turn up until earlier this year, well after the global economy started turning up last summer. Nevertheless, it is catching up with a vengeance, as it now more than double what it was at the end of last year (up 115% to be precise). At the very least, this tells us that demand for container shipments in the N. Atlantic has improved rather dramatically in recent months. Last I heard, the European economy was still alive and well, and I see today that the Euro is up 6% from its recent lows. Once again, how one can look at things like this and worry about a double-dip recession is beyond me. There's so much talk about a coming double-dip recession and the parallels between now and the 1930s that I feel compelled to counter the pervasive pessimism with some reasoned optimism. The first chart here shows PE ratios as calculated by Bloomberg. As of June 30th, they stood at 14.9, which is below the long-term average of 16.7. As Brian Wesbury notes, if you use forward earnings estimates, PE ratios are now under 12. Lots of pessimism in those figures, as I think you can see from the second chart, which compares profits according to the NIPA calculations (which in turn are based on IRS data), and standard earnings calculations based on what companies report using GAAP and writeoffs. I note that the NIPA measure of profits is much less volatile than the S&P measure, and to my eye the NIPA series tends to lead the S&P series. NIPA profits are just a shade below their all-time high (as of last March), while S&P profits are still almost 25% below their all-time high. If the NIPA series is indeed a leading indicator of reported profits, then there is plenty of good news on the profits front to come. How reasonable people can look at these strong profits numbers and conclude that we are on the verge of another recession or even a depression is beyond me. What we should be concerned about is not the absence of profits but the fact that while corporations are generally very profitable these days, they are noticeably very reluctant to invest those profits. Record levels of profits and tepid job creation is a sign of a lack of confidence in the business community, and it's not hard to understand why: consider the almost unprecedented anti-business attitude that emanates from the White House; the out-of-control federal spending that creates deep-seated fears of an eventual surge in tax burdens; the Congressional urge to dump huge new regulatory burdens on private industry; and the Federal Reserve's unprecedented purchase of $1 trillion of MBS, which creates a mountain of uncertainty in regards to future inflation and the value of the dollar. Here is a video of Steve Wynn making his views on the subject quite clear. The June ISM surveys revealed a modest deterioration in the health of the service sector, with the result that 58.1% of service sector companies, rather than 61.1% in May, reported improving business activity. But as this chart shows, month-to-month fluctuations like this are to be expected—they are almost the rule, not the exception. The important thing is that the level of the index is sharply higher than it was just six months ago, and it is showing that a clear majority of businesses see conditions improving. There is nothing in this index that would point to a double-dip recession. P.S. The correlation of this index, which I have traditionally followed, to the more frequently cited Service Sector Composite Index is 0.97. Both show almost exactly the same pattern. It's a beautiful day in So. California, especially at the beach. This is the first real sunny day we've had in almost two weeks. 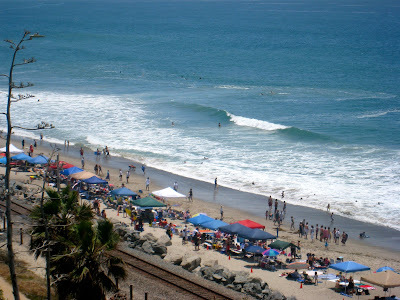 The beaches are packed but the waves are so big that not many people are swimming today. We walked along the coastal footpath to San Clemente and back earlier today, and I didn't hear a single person or see a single sign complaining about Obama or the economy—what a relief! Lots of flags and BBQs though, as people get ready to watch the fireworks tonight. 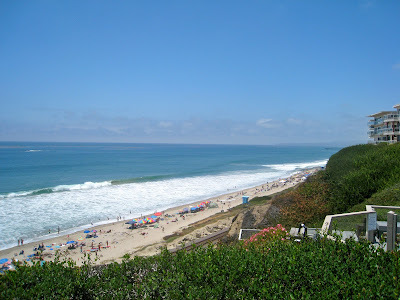 The first shot is looking down on Calafia Beach from a nearby bluff, and the second shot is looking west (Calafia beach is almost a south-facing beach) towards the San Clemente pier with Dana Point in the background. On a clearer day you can see Catalina Island off to the left.